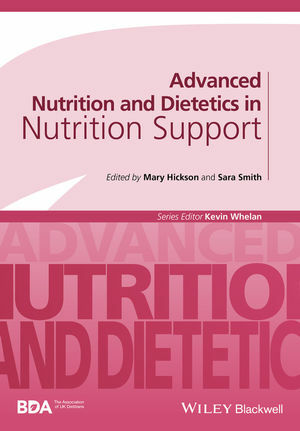 Written in conjunction with the British Dietetic Association, Advanced Nutrition and Dietetics in Nutrition Support provides a thorough and critical review of the fundamental and applied literature in nutrition support. Extensively evidence-based and internationally relevant, it discusses undernutrition, nutritional screening, assessment and interventions, as well as key clinical conditions likely to require nutrition support, and the approaches to managing this in each of these conditions. Clinically oriented, Advanced Nutrition and Dietetics in Nutrition Support is the ideal reference for all those managing undernutrition in a range of clinical areas. Mary Hickson PhD RD, is Professor of Dietetics at the University of Plymouth, UK. Sara Smith PhD RD, is Senior Lecturer in Dietetics at Queen Margaret University, UK. Kevin Whelan PhD RD FBDA, is Professor of Dietetics in the Department of Nutritional Sciences, King's College London, UK.